This is a two-part article on the power relationships and distribution in the Information Society. 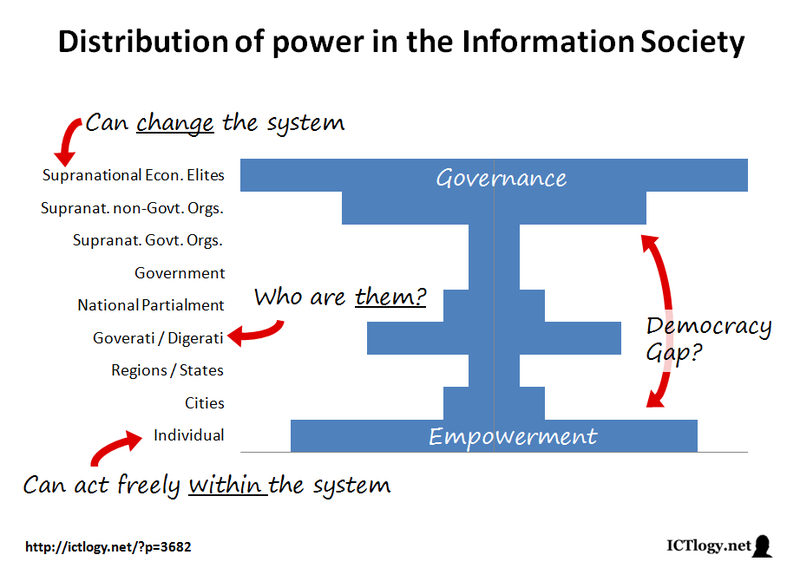 It first presents, in Empowerment and Governance in the Information Society (I): the hourglass of information power , some concepts as power, empowerment and governance, and how they have been distributed amongst citizens and institutions along ages. The second one, Empowerment and Governance in the Information Society (II): digerati, goverati and the role of ICT4D , reflects on how the quality of democracy is decreasing precisely because of an increase of citizen empowerment. This image aims at visualizing how power is distributed along all the strata of nowadays structure of society. The lower part is a hat tip to cyberutopianism, at least on what concerns individual empowerment: I believe there is enough evidence to strongly state that Information and Communication Technologies (the Internet and mobile phones and all the applications and appliances were unimaginable without them) have radically changed the degree up to which a human being can (potentially) manage their own life. Getting their own information (much more information, and on a very wide array of quality sources) and communicating with others at lowest costs and with no barriers of time and space have changed the way we can socialize and become more empowered citizens; and being able to access very low cost production tools and being able to create from scratch is an empowerment leap compared to an industrial society where capital (as a production factor) was out of reach for most people. The upper part, though, is a frontal opposition to the “now people rule the world” thesis. While people are absolutely more free/empowered to act within the system, the strings that manage and can actually change that system are way beyond the control of the e-empowered crowds. Indeed — and as recent economic and political events have proven — the ability to manage and change the system of the world is even beyond the control of the representatives of those crowds, that is, national governments and parliaments. I believe that there is a deep democratic gap between the increasingly empowered citizens and the increasingly independent, non-transparent and non-accountable forces that rule the economic and political systems from the top. Traditional institutions — parties, governments, elected representatives — fail both in upwards transmitting the citizens’ claims to shape a system according to their needs and wills, and both in top-down transmitting the need for some transformations that this system requires after the world has been made totally global, spaceless, timeless. Taking the place of those weakened democratic institutions, two new agents arise. On the one hand we have bad digerati (bad not necessarily meaning evil, though their actions — consciously or unconsciously — do harm democracy as it is now designed), digitally literate elites that leverage their knowledge and the power provided by ICTs to reshape the state of things in their own benefit. These bad digerati understand the changes in society due to ICTs, the huge lag in Law to catch up with the pace of change, the digital illiteracy of governments, politicians and citizens, and succeed in circumventing democratic institutions. Incumbent telecom operators, digital media corporations, news conglomerates, a-legal or plainly i(l)-legal businesses operating in the very verge of written law (some P2P network facilitators, some piracy-related firms, etc. ), banks and financial services, etc. Many of them are but the local/national branch of supra-national institutions and organizations that fully scape the reach of governments jurisdictions and, thus, act totally out of control. Good goverati aim just precisely at the opposite of bad digerati: correct and fix the democratic misadjustments that the Information Society brought with it. Knowledgeable and savvy both in digital and political matters, they leverage the power ICTs granted the citizenry to promote a more direct and committed involvement in public affairs: e-democracy and direct democracy, open government and open data, e-government and government 2.0, e-participation and hacktivism, etc. are some of the many initiatives that non-governmental organizations, government institutions, citizen collectives and individuals are fostering. In my opinion, though, they are quite often too helping to circumvent democratic institutions and contributing in their weakening. But the upper levels of power may actually be far too high. Thus, the ugly outcome is a complete wreckage of the democratic transmission chain, a democratic gap that both (bad) digerati and (good) goverati are but widening. Hence, the distance between the freely empowered citizen is also increasing, resulting in a democratic paradox: empowerment is not accompanied with better governance, but just the opposite. And in absence of a legitimate transmission chain, representative, plurally elected, we find different individuals and organizations (sometimes anonymous) that no one chose and that many times no one deeply knows their interests or their backing powers. When talking about the intersection of Information and Communication Technologies and Development (see, for instance ICTs, Development, disciplines and acronyms ) it is very common to focus on empowerment or the empowering factor of ICTs. Indeed, after years of cultural imperialism through development cooperation policies, development agents (especially development policies’ beneficiaries or “developees”) have developed certain allergies against anything that might sound as imposing a certain political system. But if our approach proves to be right, empowerment is nowadays becoming but the XXIst century version of bread and circus: let the hamster spin the wheel at will, but don’t it dare to open the cage. ICTs focused only in empowerment are beginning to look like development policies focused only in humanitarian aid and relief, but with no sight on the far horizon: effective in the short term, a vicious spiral towards black hole in the long run. In my opinion, ICT4D have also and always include a governance factor in their design, as development policies have to focus on sustainable development. At their turn, goverati should refrain from weakening or even attacking their democratic institutions. We have seen some of these, and this does not mean that institutions and their people should not be totally transformed, but I think the only way to leverage empowerment for governance is, precisely, through democratic institutions, because I think they are, most times, the only legitimate bridge towards real change, towards real power. Peña-López, I. (2011) “Empowerment and Governance in the Information Society (II): digerati, goverati and the role of ICT4D” In ICTlogy, #88, January 2011. Barcelona: ICTlogy. It is good to see a theoretical explanation of this idea, when I explain to someone that “people have the power” and “the multinationals have the power”, that seems contradictory, but it’s well reflected in your text. This is also something to explain to all those who critize the massive use of the Internet, saying that they cannot really change anything. Well, not true as it seems. Also, for those who participate in politics like me, it is food for thought. I participate in politics because that’s the way to change things, reaching power and changing things. But maybe it’s better to participate in a supranational NGO. But a question here: what kind of NGOs are those you are referring to? Are they Greenpeace or Amnesty International, for instance? Do you think they have that power. And another question: governments still have a lot of power to define the rules of the game. Is it considered here? Or is it considered the influence of the lobbies on the government to avoid them changing the rules? A third question: the separation of power in Spain gives power to the cities, but not that much budget. Don’t you think that the “cities” amount of power might be less in the particular case of Spain? About NGOs. Well, I definitely avoided the acronym because it leads to misunderstanding. I guess you are taking here NGO as a synonym of charity, which was not my intention. The World Wide Web consortium, the ICANN, the World Economic Forum, the Club of Rome… those are non-governmental organizations which, I think, help to shape the world as it is beyond the reach of nation-states. You can even include in this groups the big religious organizations (e.g. the Catholic Church) and, why not, huge NGOs in the sense that you took them: the Red Cross, for instance. Concerning governments, I might have been a little too pessimistic about their actual power, but I definitely wanted to stress that they are strongly determined by the national powers (in my graphic, Goverati and Digerati) and, over all, by international powers. Just keep in mind the “influence” that some supranational organizations have on national policies: the International Monetary Fund and the World Bank Group, the European Commission and the European Central Bank (for EU countries), the financial organizations that rule lending and the different stock exchanges, etc. Just take a look at the recent years and ask yourself who really dictated your countrie’s policies. About the power of cities… I think they are more “empowered” (in the sense that I used that concept) rather than having power for “governance”. That is, they are really flexible in the local arena. Of course, budgetary independence surely determines that power. great post! it is a really helpful diagram to explain and consider the state of things today.